Sonia Gandhi completes an unprecedented 15 years as Congress president today, March 14. She took over the reins of the party in March 1998 following its dismal showing in the 1998 Lok Sabha election that saw Sitaram Kesri's exit from the post. 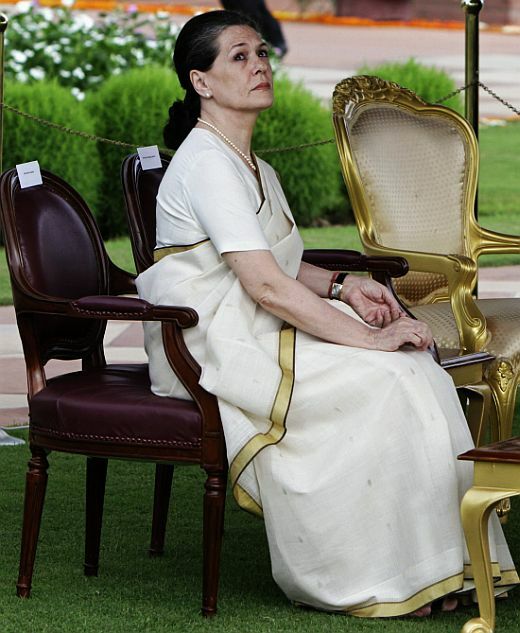 Fifteen years later the 66-year-old Indian of Italian descent is the unchallenged leader of her party, having guided the Congress twice to power, in 2004 and 2009. 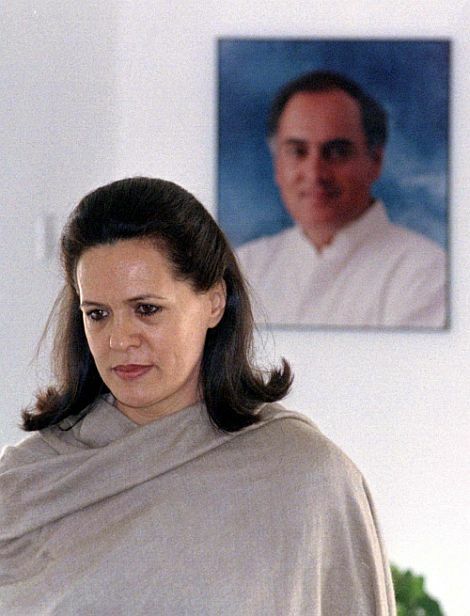 Rasheed Kidwai captures the moment when Sonia, in May 1991, who had just lost her husband to a political assassination, refused the Congress leadership. An exclusive excerpt from Kidwai's book, 24 Akbar Road -- A Short History of the People Behind the Fall and Rise of the Congress, with the kind permission of publisher Hachette India. At the conclusion of the meeting Arjun (Singh) proposed that Sonia Gandhi take over as the AICC (All India Congress Committee) chief and all the other present unanimously endorsed his proposal. Many years later, (Sharad) Pawar (who was then in the Congress party) claimed he had raised a mild objection -- a contention challenged by almost all those present at the meeting. When asked to spell out his objection, Pawar said he wanted to know if Sonia Gandhi had been consulted in this regard. He was, however, not incorrect in saying that Sonia's selection as AICC chief had not been unanimous. Significantly, many in the CWC (Congress Working Committee), particularly those who knew her, were convinced that she would not accept the job. One account claimed that when Arjun was contemplating proposing Sonia's name, Pawar had been visibly agitated. At this point someone had scribbled a tiny note saying, 'She will not accept', and had passed it to Pawar, who had sighed with relief. Yet another account has it that Arjun had only proposed Sonia's name to keep Pawar in check. All the party leaders present at the meeting at 24 Akbar Road disregarded the fact that Sonia was not even a 'char anna' member of the Congress Party. Char -- or four -- anna membership was a prerequisite for anyone joining the party. Mahatma Gandhi, who is credited with giving the Congress a mass base during India's freedom struggle, had envisaged the concept of the char anna membership. No thought was given to Sonia's complete unfamiliarity with the method and machinations of India's political system. Arjun's camp has yet another story: Arjun had approached (P V Narasimha) Rao to propose Sonia's name, but the latter refused on the grounds that he was presiding over the emergency CWC meet. The insinuation made was that Rao was working on a different agenda while projecting himself as a non-partisan person. Years later, when Arjun gained the upper hand in the Sonia-led Congress and Rao was unceremonially shown the door, his supporters added Rao's 'defiant act in 1991' to their political chargesheet against the former prime minister to convince Sonia to keep him out of all party forums. These deliberations took place while Rajiv's body still lay in state. The CWC's decision was communicated to Sonia by a group of party leaders, which included Ghulam Nabi Azad and Pranab Mukherjee. The meeting between the Congress leaders and Sonia lasted barely 10 minutes. Sonia did not say anything about it, but she must have been taken aback by the timing of the request. Family friends said that Sonia and her children did not even consider the offer. 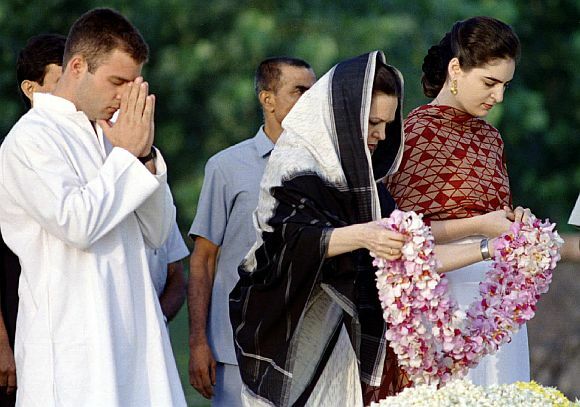 'In fact, it was considered extremely insensitive on the part of the CWC to have made such a gesture when Rajiv's funeral had not taken place,' one of them said, confirming that there was no discussion even among close friends about the CWC offer. 'We were all too shocked and grieved to discuss politics,' said a friend of Rajiv's, who later opposed Sonia's entry into politics. Actor Amitabh Bachchan, who was still close to the family, was also opposed to Sonia entering politics. At that juncture, his opinion was greatly valued. Amitabh had been unhappy with most of Rajiv's party managers, when he was an MP from Allahabad between 1985 and 1987. Amitabh is said to have recalled how Rajiv was forced to lead the party in a similar fashion after Indira's assassination and wondered how long the members of the Gandhi family would continue to make such sacrifices. Image: Sonia Gandhi and her children Rahul and Priyanka. Meanwhile, Pranab broke the news of Sonia's selection to the media and faced a hostile press. 'She is the only person who will be able to provide leadership at this crucial juncture and, under her leadership, the future of the Congress is bright,' Pranab said, summing up the CWC's deliberations. The former finance minister had an answer for everything. 'How has the Congress accepted a leader who, until 1983, was not even an Indian citizen?' he was asked. 'She is an Indian housewife and has been exercising her franchise in the New Delhi constituency,' he said. Had Sonia been consulted? Would she accept the job? 'She will accept,' Pranab said stoutly, claiming that she has been consulted informally -- a fact disputed by Sonia. Pranab said later that he has been misinformed! The family faithful was just not prepared to accept Sonia's refusal. The outgoing Congress Parliamentary Party quickly endorsed the CWC's decision. In other words, if Sonia had accepted the CWC offer, she would have been the party's candidate for prime minister after the elections in 1991. Each day, groups of party-men led by senior leaders called on Sonia, while Seva Dal workers raised slogans such as 'Rajiv Gandhi amar rahe, Soniaji lao, desh bachao (May Rajiv live forever, bring Sonia, save the country).' A disgusted Sonia finally summoned Vincent George and asked him to send the party-men away. 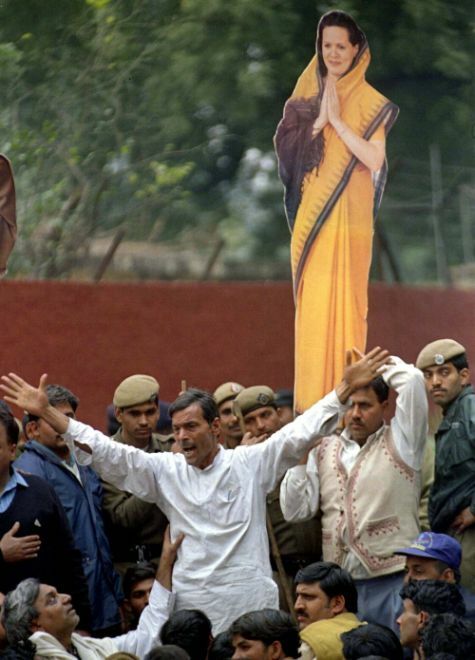 Image: Congress supporters shout pro-Sonia slogans outside her home in New Delhi.